(MPI) – Until now, the Cambodia-Laos-Vietnam Development Triangle Area (CLV DTA) has signed six cooperation documents. Treaties and Agreements of cooperation in the DTA are basically consistent, synchronous and compatible with Vietnamese policies and laws, in line with the Party and State’s foreign policy towards the cooperation relationship with Laos and Cambodia. The deployment and implementation of these agreements have brought positive results, contributing to the maintenance of peace and stability, promoting socio-economic development, protecting interests of the nation, organizations and individuals of Vietnam, this will deepen Vietnam's long-term relationship with Laos and Cambodia in the DTA in particular and between the three countries in general. Agreements related to many cooperation areas such as economics, investment, trade, culture, customs, education and training, etc., contribute to create a legal framework and favorable conditions to boost cooperation relations, economic development, facilitate the trade of goods, people and means of transportation crossing the border and are a premise for attracting investment, trade, and tourism, and improving the lives of the people in 13 provinces in the CLV DTA. As of November 2017, Vietnam had 201 investment projects in Cambodia with a total registered investment capital of 2.94 billion USD, of which there are 48 investment projects located in the Cambodian DTA with the total registered investment capital of 1.61 billion USD from Vietnam. Most of the projects from Vietnam concentrated in the fields of agriculture, rubber plantation. As of November 2017, Vietnam had 278 investment projects in Laos with a total registered investment capital aboard of 5 billion USD, includes 65 investment projects in the Lao DTA with a total investment capital from Vietnam of 1.98 billion USD, accounting for 23% of total projects and 40% of total investment from Vietnam to Laos. The projects mainly focus into the sectors of agriculture and forestry (28 projects), mining (11 projects), manufacturing and processing (12 projects), the rest are electricity production, construction, hotel business, wholesale and retail of agricultural goods and materials. 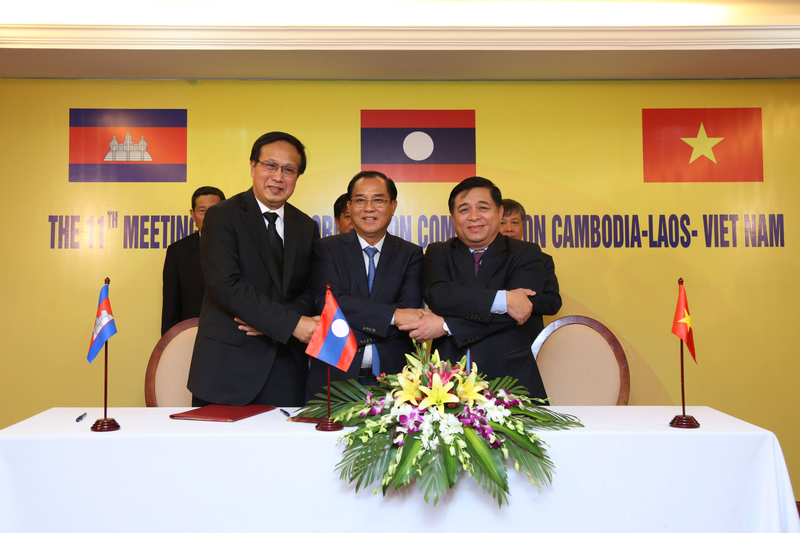 To enhance the cooperation in the CLV DTA in the coming time, the three countries need to continue to coordinate to build a master plan for the socio-economic development in the CLV DTA period 2021-2030, formulate annual plans for the deployment of the Action Plan for Cambodia – Laos – Vietnam Economic Connectivity. The three countries need to continue to implement bilateral and multilateral agreements on infrastructure, especially for transportation infrastructure, to facilitate the cross-border transportation of people and goods, interstate transportation, multimodal transportation among countries; enhance the coordination at all levels among countries to effectively implement the aimed goals; propose roadmaps and mechanisms suitable for each specific case to ensure both the implementation of common objectives and the interests of each country. At the same time, the three countries should enhance the coordination with international organizations, financial institutions, donor agencies to mobilize financial resources for investment projects to build infrastructure, as well as technical assistance and capacity-building projects to enhance connectivity; maximize support to mobilize resources from ASEAN and other Asian financial mechanisms such as the ASEAN Infrastructure Fund (AIF), the Regional Cooperation and Integration Fund (RCIF), the High-tech Infrastructure Investment Initiative Fund of Japan, the Asian Infrastructure Investment Bank (AIIB), the New Development Bank (NDB), etc. In terms of promoting economic, trade, tourism and investment exchanges, the three countries need to coordinate in formulating mechanisms and policies to prioritize the attraction of investment among DTA countries to each other to promote advantages and internal forces of each country as well as the whole region; actively support projects of enterprises investing in the DTA; assist enterprises of each country in the DTA to study the policy systems and laws of the three countries in the region, facilitate and encourage the enterprises of each side to study and explore opportunities to invest in the areas of its strength. The three counties need to simplify customs procedures, facilitate conditions for the movement of human resources, goods, equipment, and vehicles through border gates; reduce the burden of procedures, cost of bringing CLV citizens into the DTA for work; simplify transit licensing procedures for commercial vehicles, increase the duration of entry permits into Cambodia and quotas for means of transport to facilitate conditions for enterprises to expanse markets, trade, border – gate import and export. At the same time, it is necessary to renew forms of investment promotion, trade and tourism fairs in a more efficient way; promote linkages to develop tourism across the border with the motto "three countries, one destination"; soon complete the formulation and implementation of the CLV DTA Tourism Development Plan./. 6. Minutes of the Meetings of the Joint Coordination Committee of the CLV DTA from the first meeting to the recent meeting that is the 11th Meeting.